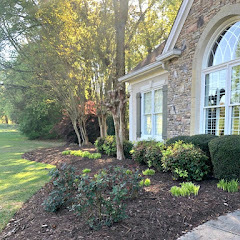 Hi friends of Savvy Southern Style. I have been a fan of Kim's since I started my blog and was thrilled to finally meet her last weekend at the Southern Bloggers Conference. She's fabulous, funny and has style (we even sported similar blue/white striped tops)! I'm so excited to share my favorite room with you - My Kitchen. 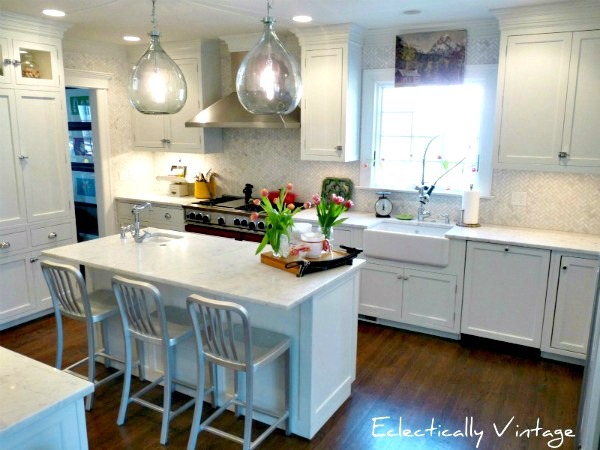 I had dreamed of a white kitchen with marble counters and vintage style latches for years. 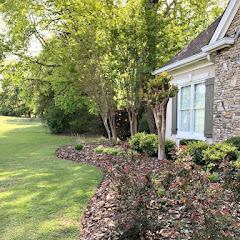 When we found our 100 year old house a few years ago, it needed lots of work (and that's putting it mildly - see my Before & After House). But my dream had come true - I could completely renovate and decorate an old house and finally get that dream kitchen. Can't you just smell the chocolate chip pancakes that my girls whip up on our red stove on Sunday mornings. Lighting is my number one favorite thing. When I spotted these demijohn (old glass wine jugs) lights, I knew they had to go over the island. I rescued this old Cocso stool right before it was tossed in the dumpster. Vintage touches are everywhere in my kitchen. 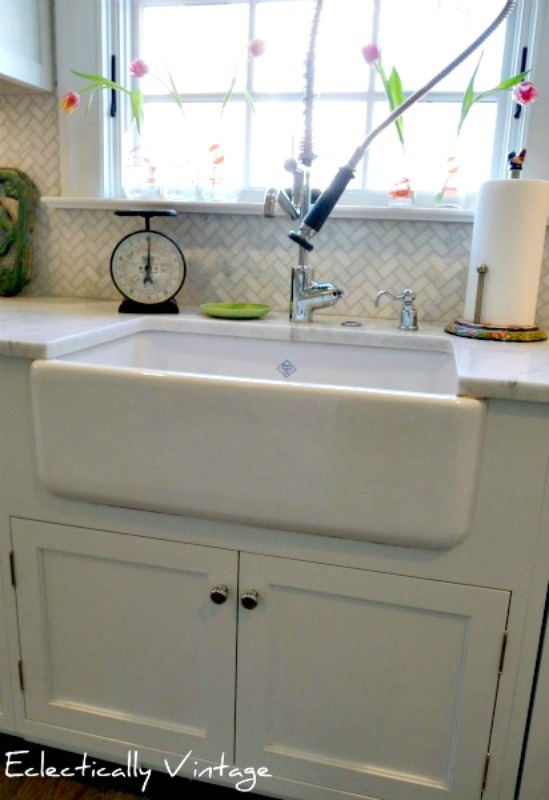 I love mixing old and new - like the vintage style farmhouse sink combined with a modern restaurant faucet. 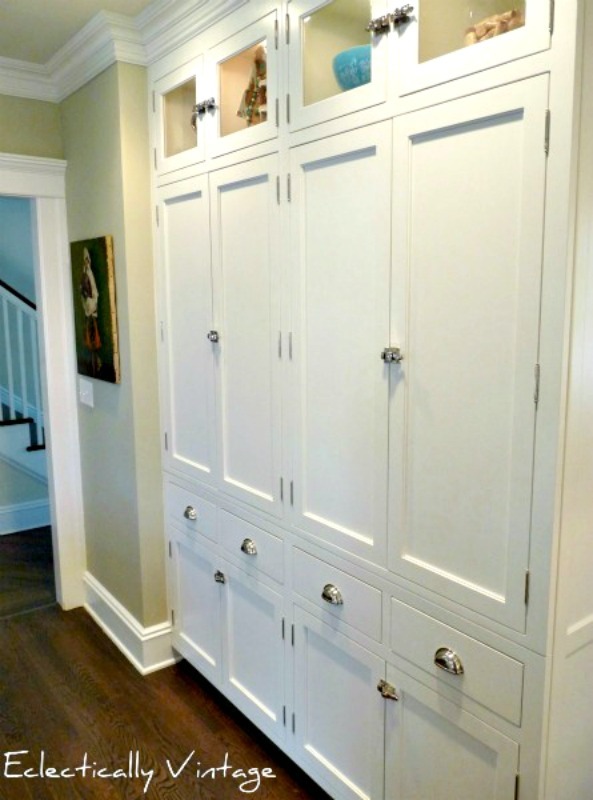 A pantry wall with slide out drawers hide essentials but glass cabinets show off vintage finds. 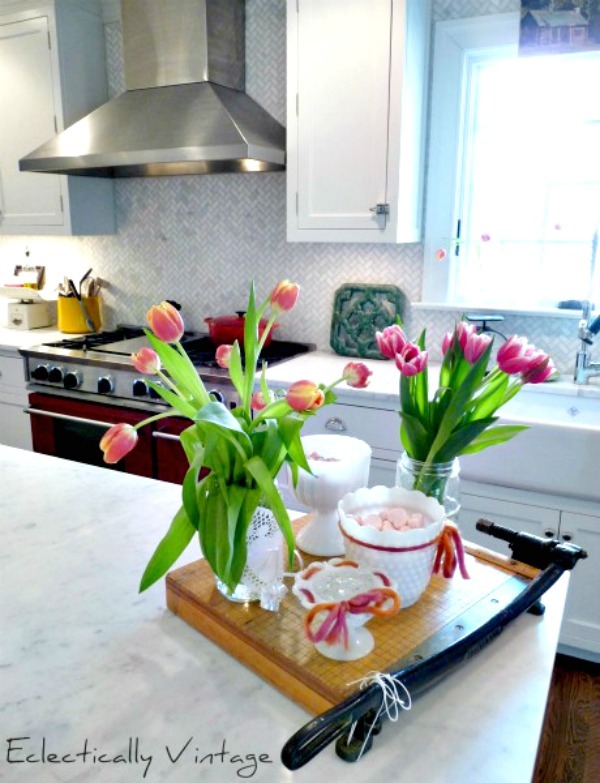 Carrara marble counters are perfect for rolling out pizza dough. So there you have it - my favorite room where we cook, laugh, make pizzas and I shake up the worlds best margarita! Hope you'll stop by Eclectically Vintage and check out my Home Tour - the door is always open. Thanks again Kim for letting me share my favorite room with your fabulous friends. Thank you, Kelly for sharing your beautiful kitchen. I could never tire of looking at it and how I would love that red stove. I believe I would cook more with that. 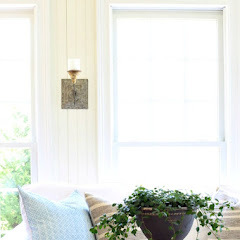 If you don't know Kelly or her blog, Eclectically Vintage, please go visit it and say hello. You will love seeing more of her home and if you love vintage items she certainly has plenty of those, too and transforms them into useful unique pieces. Such a beautiful kitchen! I love the backsplash and how bright and cheerful this space is! This is a fantastic kitchen. The details are amazing. A lucky girl indeed to have her dream kitchen. Kelly's kitchen is gorgeous, and wow what a stove. 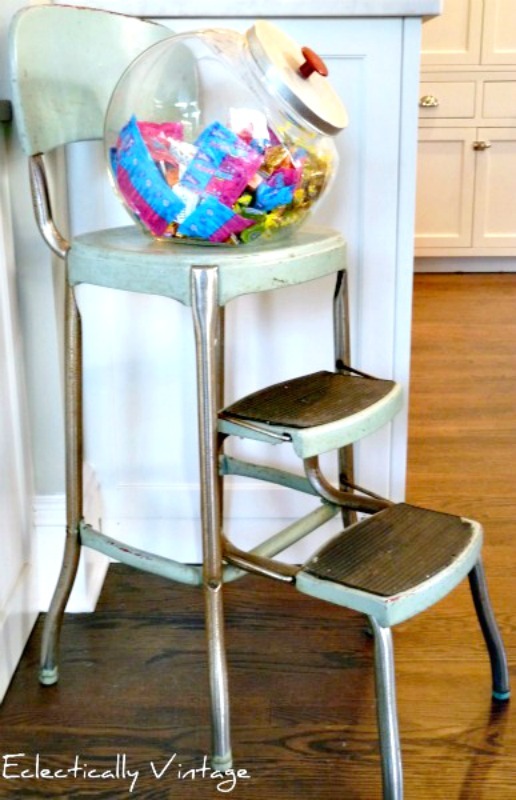 I too have one of those step stools that I inherited. Mine is yellow, so I am wondering out loud if I could paint it another color. Mine has a vinyl seat, so I don't know if you can paint vinyl. Have a great weekend Kim. Your little granddaughter is just precious. Beautiful kitchen! 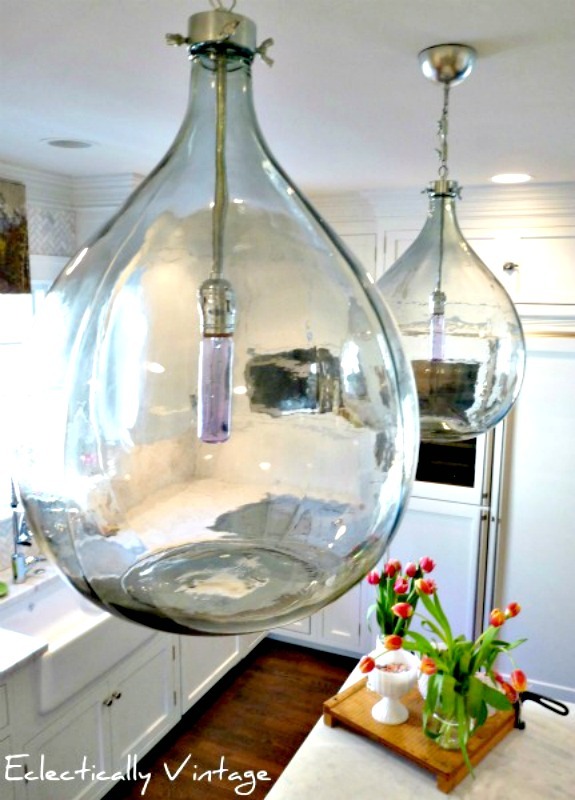 Love those demijohn pendents and her red stove is fabulous!! Kelly has the greatest style! Those lights in her kitchen are an amazing focal point and sets the tone for the whole room. LOVE it! Beautiful kitchen! LOVE all that white!Those counters are beautiful!!! Beautiful kitchen Kelly. The lights are the bomb diggity. Truly fabulous! 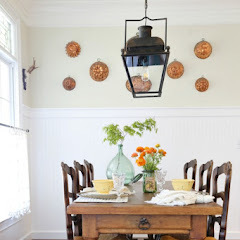 I love the demijohn lighting, the vintage step stool (my grandmother had the same in yellow!) and your stove is to die for! Kelly has great style! Thank you for leaving a sweet comment on Zu Haus at Home....I hope you have a wonderful weekend! A RED stove ~ sigh. . . Your kitchen is so amazing, Kelly! Ahhh..Kelly's kitchen is magnificent! Great feature Kim. Thanks so much for sharing my favorite room! How fun to look at clean pics of my kitchen - right now, it's filled with dirty dishes! I'll just stare at these pics and avert my eyes from my real kitchen! I love that red stove! Gorgeous kitchen! Kelly, you have an amazing kitchen! Everything is so beautiful. I love the marble! I wish I could have gone and met all of you. I'm going to next time for sure! Wonderful kitchen...and the red stove just tops it off..who couldn't enjoy making memories there? I never get tired of seeing that fabulous kitchen of Kelly's! Wow, what a beautiful kitchen! The red stove makes my heart skip a beat! Kelly's kitchen is dynamite with that red stove! 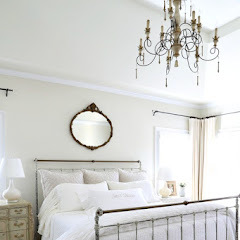 Thank you Kim for another great choice for the Favorite Room. Kelly's kitchen is wonderful, I love her style. Belated birthday to your beautiful granddaughter! great kitchen....that red range is over the top...I would kill for it!!! and love those lights over the island....wonderful room! Kelly's kitchen is fantastic! 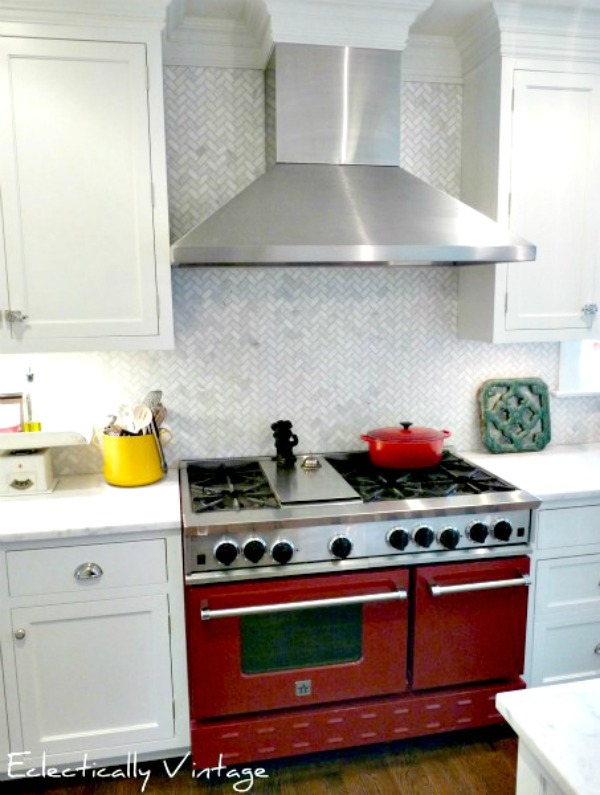 Of course the red stove is the bomb, but I also love the marble countertops and the herringbone patterned backsplash. It's easy to see why this is her favorite room! What a wonderful kitchen! Darling old paper cutter on the island. I'd would love the red stove as well, but don't think it would make me want to cook more. No cure for that! Kelly is funny, she is caring, thoughtful, and has a darn good looking kitchen 'ta boot. I even see something new I have to pin to remind me for a project. Oh, and that stool...I have a red one just like it! I love Kelly's decorating style. She has a beautiful kitchen. Absolutely beautiful! I would kill for a kitchen like that. :) Thanks to both of you for sharing! Kelly's kitchen is definitely wonderful. Kelly's kitchen is my favorite room too! I just adore, adore, adore! Kelly, your kitchen is spectacular...I never tire of seeing that beautiful kitchen with so many wonderful vintage details...and that stove...I truly heart that stove!!! 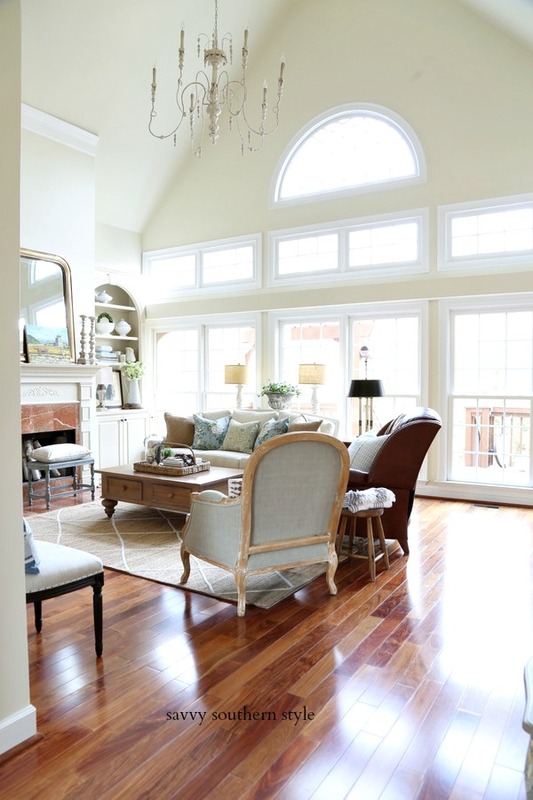 Thanks Kim for another great feature...I love your Friday Favorite Room features!! Kelly your kitchen is stunning, as you are. Loving that red store, and marble countertops. We have homemade pizza night with our kids, love doing that!